Philosopher George Santayana once said, “History is a pack of lies about events that never happened told by people who weren’t there”. Spend a little time enmeshed in the fast-paced reality creation engine that is social media, and you will quickly realize the steadfast conviction that “history is lies” has been promoted from pithy trope to a tenet of the faith, that faith being the democratization of information ushered in by the Internet Age. But have we truly democratized “information” or rather, opinion? Certainly, history is always written from a perspective, even when eyewitnesses are available, and library shelves are lined with unread tomes spanning millennia which contain a variety of errors, mistakes, misunderstandings, and deliberate obfuscations. An uncritical reading of history can turn up all manner of inaccuracies and gaps in knowledge that our condensed textbooks gloss over in the interest of a good narrative, a coherent political agenda, or the oppression of the man, but blithely dismissing historical inquiry on this basis neglects the fact that history at its most illuminating is an anthropology of the dead. The modern anthropologist relies on live informants to inscribe events in a nested set of interpretations – what the anthropologist can actually see and how they themselves understand it, and how this differs from an interpretation through a different cultural lens. Historians are frequently faced with dead informants, who are notoriously hard to engage in conversation, thus gleaning those precious nuggets about the human condition that emerge from holding up a mirror to ourselves as we examine another culture, or civilization, is all the more difficult. History can lie and no doubt sometimes does, but the all too common impulse to blithely dismiss history as a sort of refined propaganda neglects the fact that the lie resides in the gap between interpretations, and the failure to recognize that how the story is told is as important as the facts themselves, as the truth may never be conclusively known. Take something as simple as fishing. Fishing is a weird activity for a land animal, but archaeologists believe there is solid evidence that mankind was fishing during the Upper Paleolithic (roughly 40,000 years ago). Maybe it all started as simply as a caveman getting himself a drink in the nearby stream and noticing the presence of critters in his beverage, and as cavemen were wont to do in most circumstances, he asked himself, “I wonder what that tastes like?” Perhaps you are a devoted angler committed to the Zen-like pleasure of waiting for the fish to bite, and it all seems very natural from your cultural perspective, and its undoubtedly a less chancy proposition than taking down a mammoth with a spear, but then again a mammoth has the endearing quality of being rather meaty. Effective subsistence fishing requires some technological innovation. Hands are trumped by baited hooks, and hooks are decidedly less efficient than nets. Folklore cross-culturally and cross-temporally recognizes that the development of the fishing net was fundamental to upscaled attempts at ensuring a healthy dinner, and largely attributes its introduction to our observations of a robust, pre-existing fairy fishing industry. The Maori, the eastern Polynesian folks believed to have settled in New Zealand, sometime in the 13th Century A.D. were skilled sailors and fisherman that relied heavily on the bounty of the sea, most early settlements appearing no further than 6 miles inland from the water. Maori mythology holds that the upland forests and hills of New Zealand were already occupied by tiny, fair-complexioned critters called Patu-paiarehe (reminiscent of European fairies) that were consummate fisherman, and that Maori knowledge of how to make fishing nets was obtained through a little corporate espionage. It is supposed by some that they were really tribes of aborigines whom the Maoris found dwelling in this wild new land when they arrived here from the isles of Polynesia. But the old Maoris say that they still inhabit certain of the lofty forest-clad mountains of Aotearoa—a numerous people, some of them tiny gnomes and elves and pixies, some of them in the presentment of men and women of this world but smaller and exquisitely – shaped and with fair hair and fair skins just like Europeans. They are known to the Maoris by several names: Turehu, Tahurangi, Maero, and Patu-paiarehe; but their common designation is Patu-paiarehe. They are a bright, cheerful race, and take great pleasure in music. They are skilled in charms and the art of enchantment, and many a strange adventure has happened to the Maori who has had the temerity to venture into their haunts. Like the elves of other countries, these fairies of Maori Land dread daylight, and appear only by night. Sometimes, on dark and gloomy days, when the thick mists descend and envelop the bare crags and deep ravines of the mountains of the South, the fairy people will be heard chanting songs in a thin sweet cadence, and then too will be heard the doleful sound of the fairy trumpet, and the faint and plaintive music of the Koauau, or nose-flute, and the voices of the fairy children laughing and singing above the clouds. But most of all they love the thickly-wooded mountains of the North, the Fish of Maui, where they live in their little pas, palisaded like those of the Maoris, and adorned with quaint little carvings and diminutive figures of fairy ancestors. Few mortals can discover those pas. They are hidden far away in the shadiest recesses of the bush, where the mist-maidens hover all day long, and where the Goddess of the Clouds descends nightly and covers her fairy children with her loving mantle. A Tohunga alone can perceive those stockades and houses of the Patu-paiarehe. To ordinary folk who penetrate the fairy country, those works of the little people are to all appearance mere trees and rocks and beds of ferns. But, if you have the wise eye and the Tohunga’s understanding, you will see that the great rimu pine, with its drooping waterfall of golden foliage, and the lance-like kahikatea, tall and stately, the knotted and gnarled rata, the graceful nikau palm, and the lovely tree-fern, swishing gently its broad feather-fronds, are all part and portion of the Patu-paiarehe dwellings. For the fairies are ever of the forests: with the forest-trees they live, and with the passing of the forests they, too, pass away. Many are the stories told of the fairy people and their encounters with mortals. One story says that it was from a party of fairies who were fishing by night for mackerel (tawatawa) in a bay in the far North, where they were joined by adventurous Maoris, and who, being surprised by daylight, fled, leaving their nets on the beach, that the Maori people first learned the pattern and hitch used in making the large seine fishing-nets (Ditmer, 1907, p74). In Norse mythology, a lot of ink has been spilled trying to parse out what exactly Loki was, theories ranging from a full-fledge member of the pantheon, to a trickster, to an evil antagonist, or a Promethean figure. Let’s just say that Loki was a complicated and vaguely elfen dude, but he is credited (much like Prometheus stealing fire) with inventing the fishing net and passing it on to us pesky humans. Salish-language Native Americans of the Pacific Northwest coast tell traditional tales of human-like ancestors, generally referred to as “transformers”, that intermingled and sometimes shared kinship relations with the first peoples and taught them all manner of useful things, including advanced fishing techniques. The Transformers taught people how to make tools and implements. They carried patterns drawn on hide of every object that people use. They taught people how to make fire-drills, how to cook, how to work stone, flake arrow-heads and spears, how to make knives and harpoons. When they reached the Fraser Canyon, near Spuzzum, they saw that the river was full of salmon, which were ascending the stream. Across the river they saw a man trying to catch salmon. He had a long rope of cedar-bark fastened around the waist of a boy whom he lowered down over the cliff to the river, where the boy tried to catch the salmon with his hands. They watched, and saw that he was unable to catch any. After a while the man pulled the boy up, and the two sat down on the ground to rest. The man thought, “If only somebody would teach us how to catch these fish! Then we should have plenty to eat.” The Transformers held up their hands above their heads, the palms turned towards the man, and at once he saw them and understood them. One of the Transformers held up a pattern, and at once the man understood it and copied it. It represented bark twine, and he at once made some twine. Then the Transformer held up another pattern, and the man understood it. He made a bag-net. The Transformer held up another pattern, and the man knew at once how to make the hoop for his dip-net. When the net was finished, he wondered what he was to do with it. The Transformer showed him how to catch salmon and how to cook and cure it (Boas, 1917, p14). The classic Celtic fairy, notoriously fussy about their foodstuffs, apparently maintained industrialized fishing, and Manx fishermen kept a close eye out for the fairy fishing fleet, since where it was sited promised to be a good location to spread one’s nets, suggesting an early adoption of the practice that we nowadays refer to as “business intelligence”. There are many ﬁshermen here to this day that declare that they have seen the fairy herring ﬂeet lying before their nets, with their lights upon the water, and the buoys or ﬂoats of their nets, and fully expected that when the day broke they would see numbers of boats around them, but when the day appeared there were none there, to their very great surprise. There was sure to be a shoal of herrings where the fairy ﬂeet was seen, and the boats that shot their nets there were certain to have a good ﬁshing. The Manx ﬁshermen believed that the fairies, besides ﬁshing on their own account, made barrels, and cured the herrings they caught. A cave on the sea-coast under Cronk-yn-Irree Laa is called Ooig-ny-Seyir, Cave of the Carpenter, where the ﬁshermen have heard them, times without number, making barrels. They were always sure to have a good ﬁshing in the Big Bay when they heard the fairies making barrels. That season always turned out well (Cashen, 1912, p18). Did some savvy Upper Paleolithic lad simply get tired of the interminable waiting and knitted himself a net, so he could take the battle to the fish? Or did mankind steal the idea from fairies? The origins of our fondness for an aquatic snack are so remote that attributing the development of commercial fishing to any particular source is an exercise in futility (except for those insufferable pedants who maintain that nothing strange has ever existed in the universe), rather the more interesting question is why humanity has traditionally ascribed the origins of fishing to the observance of some supernatural agency? 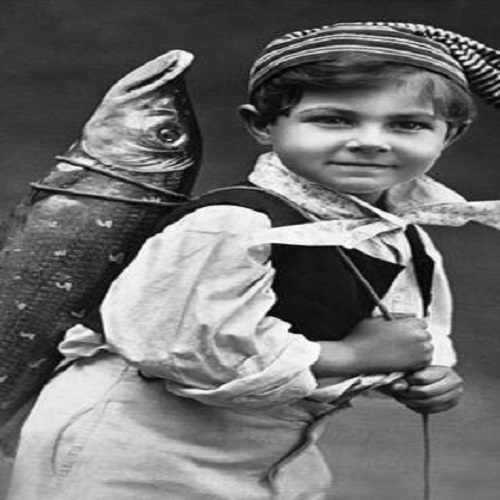 In the gap between what we can never know and how we tell ourselves about it, we find those kernels of human truth that are the mark of relevant historical interpretation – that is, (1) humans have always been a bunch of thieving bastards, and (2) fishing is weird. Boas, Franz, 1858-1942. Folk-tales of Salishan And Sahaptin Tribes. Lancaster, Pa.: and New York, American folk-lore society, 1917. Cashen, William. Manx Folklore. Douglas: Johnson, 1912. Dittmer, Wilhelm, 1865-. Te Tohunga: the Ancient Legends And Traditions of the Maoris. London: G. Routledge & Sons , 1907. Esoterx must be on good terms with the gods of synchronicity. Here we have an article about the origins of fishing just at the time the world is rapidly depleting the remaining stocks of fish species in the oceans and seas, as part of what scientists term the “sixth great extinction” of all species on the planet. It is human nature to take things we habitually use for granted. When they have disappeared they then become of interest to scientists and academics in their origin, function, and ultimate significance. We can eventually expect a gaggle of Ph.D. theses on the origin of fishing and its part in human culture after no wild species are available for serious study. Will fishing be replaced by commercial fish farms like hunting and gathering were effectively replaced by livestock and agriculture? Only scientists can tell us if the labor and investment in fish food is well worth the return in fish protein. But for those who appreciate a good fish tale, I just happened to run across a Jewish prophecy in Ezekiel 47:9-10 which promises that the Dead Sea will be turned into a vast fishing area containing many varieties of fish. The fish will be so plentiful that nets will be in use. It seems to sound, or more appropriately smell, like a fisherman’s heaven. Perhaps the fairies of fishing did not actually do their work in vain. Ah, if only the Gods of Synchronicity had a pension plan…I’d rather quit my day job, write about anomalistics, and frankly. go fishing….